Lucky 7s Video Slot Guide & Review - Casino Answers! 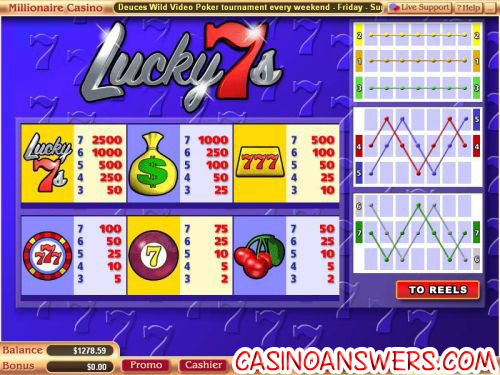 Lucky 7s is a 7-reel, 7-line video slot from Vegas Technology. 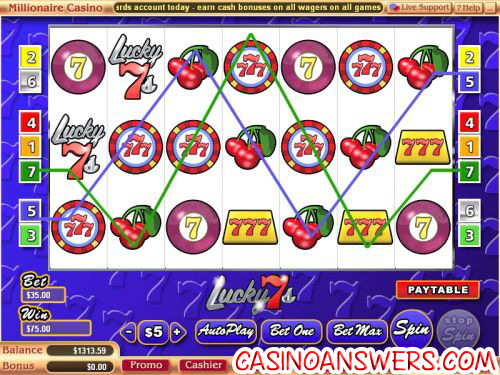 You can play Lucky 7s at US-friendly online casinos Millionaire Casino and Go Casino. To play Lucky 7s, you must first pick a coin value. Coin values available are $0.01, $0.05, $0.25, $2, $5, $10 or $25. As you can see, the coin values are hardly standard for a Vegas Tech video slot, lacking anything between a quarter and two dollars. One of the positives to Lucky 7s is it is only 7 lines, as compared to some of the more massive and perhaps daunting video slots some of these online casinos have. Betting on all 7 lines is not very expensive. A bet on all lines can cost you $0.07 or it can cost you $175, which makes Lucky 7s suitable for both high and low stakes gamblers. To change your line bet, click “Bet One” as many times as you need to, or you can click the number on the sides of the video screen. To bet all 7 lines, just use the “Bet Max” button and you will spin Lucky 7s’ reels automatically. If you like a good autoplay feature, the Lucky 7s video slot provides one for you. You can set the number of spins (5, 10, 25, 50, 100, 250 or 500) and the number of seconds between spins (0.25, 0.50, 1, 1.5 or 2 seconds). You can also choose your stop settings, including not until all spins are complete (the default option), stop when jackpot is won, stop if a win exceeds or equals your selected amount, stop on any win you receive, stop if credits are increased by your selected amount and stop if credits are decreased by your selected amount. You can stop autoplay at any time. Lucky 7s doesn’t have all of the bells and whistles of many video slots. It lacks wild and scatter symbols, a bonus game and free spins. The sound effects are good, but nothing special. The graphics are below average for a modern video slot. The animations are simple; there’s nothing wrong with them but nothing to write home about. There are no gimmicks to speak of. Still, we feel that this is part of Lucky 7s appeal for many players. If you’re looking for a basic 7-reel slot machine like Lucky 7s, you can give it a try over at Millionaire Casino. Is this Lucky 7s the same as the one found on the Cryptologic platform? The Lucky 7s at Millionaire Casino has nothing to do with, and bares no resemblance to the Lucky 7s over at Cryptologic casinos like VIP Casino. They merely share the same name. Is there two Lucky 7s Slots? Is there any slot machines based on lucky sevens?